I had some beansprouts leftover from last night’s Thai green curry and they get slimy so quickly that they definitely needed using today. I really couldn’t fancy a stirfry and I was wondering whether to go for a pad Thai, VWAV style, but then I remembered pho! I’d never eaten Vietnamese food before our trip to Seattle last month. I fell in love with it immediately especially the comforting bowl of hugs that is pho. 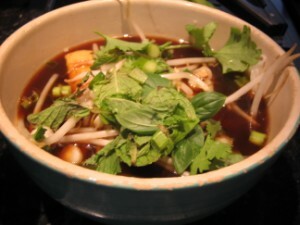 I determined there and then to try making my own pho at home. Now I know that true pho is not vegan but I see nothing wrong with the idea of a flavourful noodle soup with tofu, fresh herbs, beansprouts and chilli. I browsed around the internet and went for this version as I had all the ingredients at home. I used Taifun tofu fillets and I thinly sliced half of them and fried until crisp, and cubed the other half, to get different textures. It definitely wasn’t as god as the pho we had in Seattle or San Francisco but we ate 2 bowls each and with lots of fresh green chilli it slipped down a treat. Less rain than Seattle, too! This entry was posted in Soup by efcliz. Bookmark the permalink.